Residents, developers at odds over future of southside landmark. A flock of Canada geese occupy the south end zone, where a century of football teams sprinted for touchdowns. A half-dozen tennis courts are partially flooded, though the nets remain firm, ready to bat down aggressive serves. A dull patch of asphalt bears the fading blue, white and yellow lines that once guided 15-year-olds to coveted driver's licenses. The buildings, some more than a century old, sit vacant, their windows and doors sealed shut with plywood. "No Trespassing" signs are plastered on the chained gates leading to the four-lane track and on the outskirts of the tennis courts. And at the entrances of Granite High School, home of the Farmers, are unsettling signs that read "Asbestos Hazard." Closed in 2009 because of declining enrollment, the 27-acre patch of land—the biggest vacant parcel in the city of South Salt Lake—could soon be home to a mix of single family homes and a 50,000-square-foot Wal-Mart. Garbett Homes and Wasatch Commercial Management have petitioned the city to rezone the property from its historical designation to mixed-use and commercial. In spite of a wave of criticism from residents, the city's planning commission approved the zoning switch in January—a decision that has set the stage for a battle at the Feb. 24 city council meeting. At stake, opponents of the development say, is valuable open space and recreational opportunities for the city of 23,000 people that, since Granite High School was constructed in 1907, has transformed from agriculture to residential uses and is now decidedly more commercial and industrial. South Salt Lake City Mayor Cherie Wood says that when the Granite School District voted to shutter the school in 2009, the community mourned its loss. 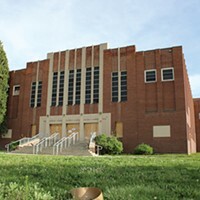 Realizing the school's value as a community asset, the city in 2011 attempted to secure a bond to purchase the school. By a mere five votes, 1,006 to 1,001, the initiative failed, spurring the school district to begin courting developers. Wood, who played basketball at Granite High School, says that reality began to sink in when a developer emerged in early 2015 with a proposal to erect high-density housing on the lot. This plan was followed by an effort to build more than 100 single-family homes, and was followed in short order by the current pitch for a Wal-Mart. Opposition to the plans, Wood says, has been stoked by the whisker-thin margin with which the bond failed. And, according to voter statistics, only about one-third of the city's 6,680 registered voters in 2011 cast a ballot. "I think we didn't see the disappointment that people felt until the first plan came to the city council about a year ago," Wood says. "Many people stand up and say, 'I didn't vote. I wish I would have voted. If I would have known that this was going to be the development there, I would have voted.'" Had voters approved the $25 million bond in 2011, the site would have been transformed into a civic center, where offices for nonprofit organizations, after-school programs and a preschool would have been housed. A recreation center would have emerged surrounding the pool and gymnasium facilities and the outdoor spaces would have been preserved. When the city couldn't buy the property, Granite School District put it on the market. Now, the $10.6 million that Garbett and Wasatch have agreed to pay for it will be used to finance the district's fleet of other schools that serve 68,000 students. But that $10.6 million, says Ben Horsley, communications director for Granite School District, will only flow into the district's coffers if the South Salt Lake City Council approves the zoning change—the first hurdle in the project's approval process. Horsley is well aware that residents have decried having a Wal-Mart plopped down in their backyards (the school grounds are surrounded on all four sides by apartments and single-family homes). 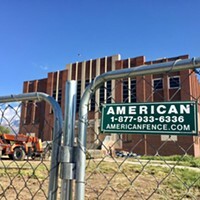 But, he says that Garbett and Wasatch were one of many possible suitors for the property, and all options included a mix of commercial and residential. As a result, if the superstore plan isn't approved, he doubts if many of the other projects could win approval, either—a possibility that would continue to put the brakes on the district's desire to rid itself of the property. "With respect to what's currently going on with the controversy, or concern with the Wal-Mart, I think it needs to be understood that pretty much any developer is going to have, with respect to that property, some sort of commercial aspect," Horsley says. "That is obviously outside the bounds of our control." From a height of around 2,300 students enrolled in the late 1980s, Horsley says that by 2009, only 255 students were attending the school, although 400 were living within its boundary. He says the flight of students away from the school, which sits near 3300 South and 500 East, tracks closely with the school district's rapid growth in the suburbs. "When you started to see significant growth in the overall school district is when you started to see Granite High start to decline," Horsley says. While the school district, the developers and anyone keen on sales-tax revenues generated by a Wal-Mart's brisk sales of everything from mayonnaise to Wrangler jeans are anxious to see the property developed, Mark Kindred, an at-large member of the city council, says the city can and should weigh heavily concerns from nearby residents about increased traffic and other woes that could accompany a mega-retailer. "The neighborhood has made it plainly clear that they don't want a Wal-Mart, and I appreciate that; I understand that," Kindred says. "I don't think they want us, the council, to shove it through their throats." At the same time, Kindred says residents had a chance to buy the property and didn't. And he knows two things for sure: The property is not going to ever be a school again, nor is it going to be a 27-acre park. These realities, he says, require that the city alter the way the property is zoned but retain tight control over how development unfolds there. By its own estimates, South Salt Lake City lags in its inventory of parks, open space, bike trails and recreation centers. According to a city study conducted through its master-plan process in 2015, as the city grows over the next decade, it will need 40.2 additional acres of parks space. An attempt in 2015 to secure a $13 million bond to acquire parks and open space, some of which might have been used to secure pieces of Granite High School, failed by 65 votes. A voter information packet pitching the bond to residents noted that South Salt Lake has 1.6 acres of parks and recreation facilities for every 1,000 residents, while neighboring Salt Lake City has 4.5 acres per 1,000 residents. The national average, the packet says, is 16.2 acres per 1,000 residents. But space is getting harder to come by. Mike Florence, the city's director of Community Development, says that Granite High School is the largest unoccupied parcel in the city. "Everything we do here in South Salt Lake is redevelopment," Florence says. "It's buying property, having to relocate a business and tear down a building." There remains a chance that the city council on Tuesday will refuse to grant the rezone, forcing the school district, developers and residents to take a long look at the property's future. "They absolutely do have that power," Wood says of the council's latitude on refusing to green-light the rezone. "I feel that as a community, that we hold true to holding that public process and giving people an opportunity to come and be heard about the project." The sliver of solace residents took in the decade since students stopped appearing at Granite High was the district's willingness to leave the gates open to the track and the fields. But that stopped about year ago, Horsley says, when bicyclists and skateboarders were caught filming their high-flying exploits on school grounds. The district was also sued by a person whose child fell from the bleachers. Horsley says the suit was settled for tens of thousands of dollars. Inside the buildings, he says, water pipes have frozen and burst, causing flooding; asbestos has become exposed, creating a safety hazard, and some elaborate efforts have been undertaken to strip the walls of copper wiring. As the vacant school became a drain on policing resources, Horsley says efforts were made to block off the sports fields and any window that could be reached by a human was boarded up. "Unfortunately, the community's not allowed to use it anymore," Horsley says. A rare exception is the driver's education course. On a frozen morning in February, as the track lay idle, the tennis courts drowning in water and the school looking like a bombed out relic of war, a smiling young girl steered a brand new Toyota Corolla around the course, a parent coaching from the passenger seat. Correction: This story has been updated to correct the number of students attending Granite High School when it was closed in 2009, which was 255. South Salt Lake City Mayor Cherie Wood's title has also been corrected. 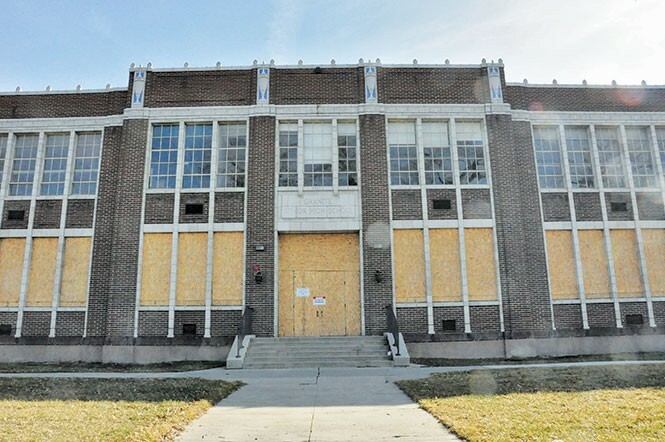 Plans to raze former high school underway. Developers, preservationists at odds over Granite High's future.